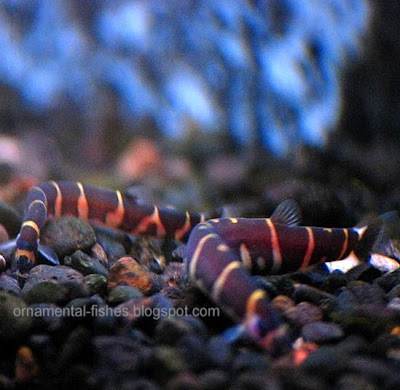 Loach or loach fish (Cobitidae) comprise many brightly coloured species and are popular Ornamental fishes. Loach belong to the family Cobitidae under the order Cypriniformes. The family Cobitidae is further classified into two subfamilies, Cobitinae and Botiinae. The species belonging to subfamily Botiinae are brightly coloured and are popular with aquarists. These ornamental pet are very important in the aquarium trade. These ornamental fish are varied in colours and shapes. Some Cobitidae are vermiform, having an elongated and thin body, whereas others are fusiform, having a spindle shaped body. Some of the salient features and characteristics of the these ornamental fish are described below. Most of the true ornamental loach lack true scales. Like many Cypriniformes and most of catfish family, Cobitidae have barbels (2-6 pairs) at their mouth. Their mouth is small and ventral (bottom facing). They exhibit below their eye an erectile spine. They have a single row of pharyngeal teeth. They have benthic life style and are bottom living. They have the ability to gulp air from the atmosphere for breathing and can live and survive in waters with low oxygen content. Most of them are omnivorous and are scavengers eating on the bottom detritus and invertebrates. Some species, especially those of genus Misgurnus, show peculiar activities with change in air pressure. The cobitidae are distributed widely in the European and Asian regions. In Africa they are present in Morocco. They are mostly freshwater fish living in riverine ecosystems. These are very hardy and peaceful and are easy to maintain. They prefer warmer waters and can stand acidity variation. These ornamental fish are shy and nocturnal and are active in low light. They tend to rest on their side for considerable time. These pets are preferably kept in groups of three or more. These ornamental fish require plenty of hiding spots. They can be kept in a community tank. They have the habit of burrowing and any hard substrate may injure their barbels. These ornamental fish are omnivorous and bottom feeders. The fish of Cobitidae family scavenge and eat the bottom detritus. These fish also eat the bottom living insects, shrimp and worms. 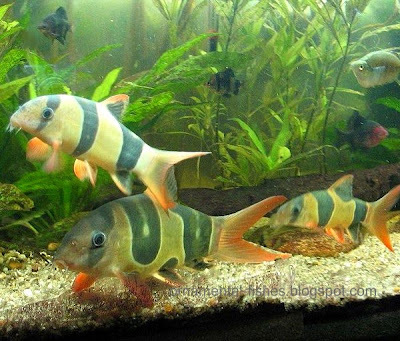 In freshwater aquariums they are fed with formulated feed like flakes and pellets. They will also accept freeze dried worms. Live feeds like worms, insect larvae, brine shrimp larvae and small snails can be given. These Cobitidae ornamental fish are hard to breed in artificial conditions. Both sexes of these fish of Cobitidae family are similar in appearance; males tend to be a bit slender. Female when mature is easily distinguishable due to its rounded stomach with eggs. Commercial breeding of these ornamental Cobitidae is yet to be achieved.